All Susan’s CBD products are available for purchase!! Cannabidiol (CBD) is a naturally occurring cannabinoid (chemical compound) of the hemp plant. Our products come from 100% federally legal industrial hemp, grown organically under the Colorado sun. Our products begin to work almost immediately to relieve pain*. Because we use a special, concentrated form of cannabidiol (CBD), relief comes quickly and lasts longer to help keep your pain in check*. Unlike THC; the most common compound in cannabis, the products we use will not give you any psychoactive effects as they contain zero THC. CBD oil extracted from the cannabis hemp plant is now being applied topically as a cream, salve, lotion, balm or oil, taken orally as a tincture and in baths and foot soaks. When applied topically, CBD oil is absorbed into the skin and targets cannabinoid receptors found in the skin’s mast cells and nerve fibers. This gives a calming, anti-inflammatory effect with localized benefits all over the skin and muscles. 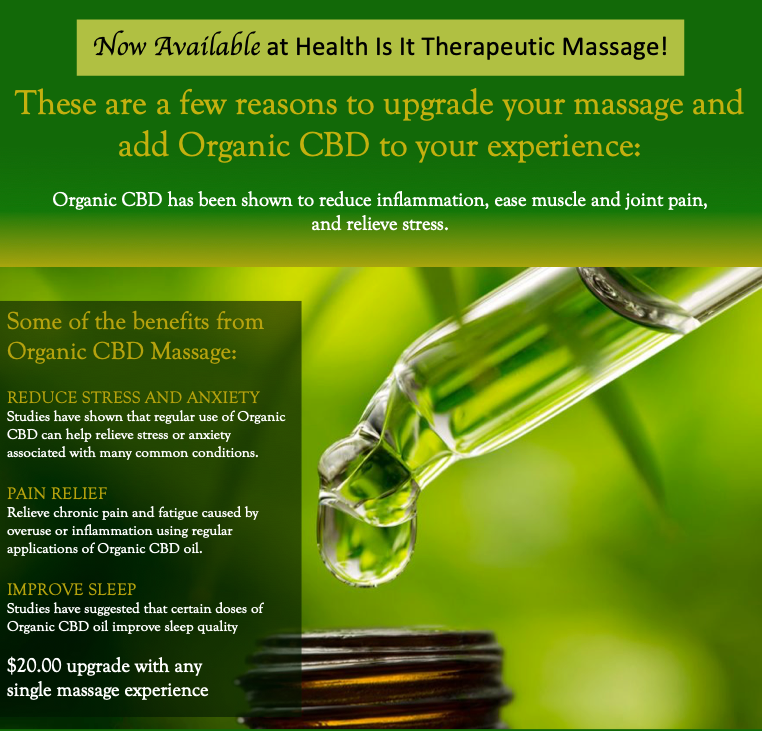 Massages have been used as a holistic healing practice for centuries, and with infusion of pure hemp CBD oil, it makes for a potent remedy. Enhances the benefits and experience of massage by decreasing acute and chronic pain, inflammation, anxiety, depression, headaches, migraines, helps clear skin and slow the skins aging process, mental exhaustion and sleep disorders. These are just some of the benefits you may experience using our products. More scientific research is being done on the benefits of CBD. I encourage you to research.